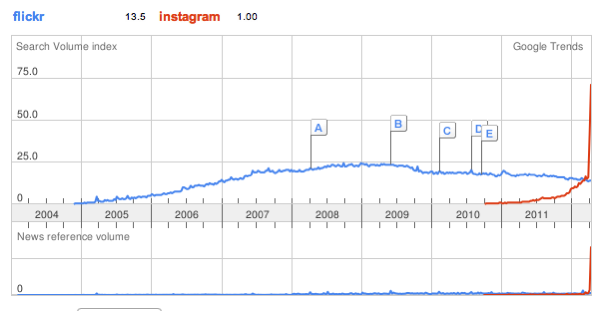 The Google Trends lines for Flickr and Instagram have finally crossed. I think it’s a pity. There are tools around Flickr that I’d like to build that I’m probably not going to, because I don’t have any faith in it still being around in a year’s time. This attitude doesn’t make any sense, because I pay Flickr money, and Instagram still don’t seem to have any sort of sensible business model. How badly can Yahoo! have messed up here that I’m preferring Instagram right now? the Google Trends for Flickr vs Instagram. Firsly, I see that, compared to Flickr, Instagram is a meaningless blip. anything interesting enough to get noticed by Google for the entire time that Instagram has existed.